This course is the first of 3 modules making up the City & Guilds 7543 Mobile Air Conditioning System (MACS) Certificate and has been designed to provide the essential practical knowledge in automotive air conditioning fundamentals and refrigerant handling. This enables technicians to carry out refrigerant recovery activities in a professional, safe and legal manner. This unit may be taken on its own and is recognised by the UK Government as meeting the minimum requirements of the European Commission Directive 307/2008. This regulation requires that persons handling fluorinated gases must be appropriately trained and posses a certificate attesting to the fact. On successful completion, candidates will obtain the City & Guilds 7543-01-001 Level 3 certificate in the Safe Handling of Refrigerants for Mobile Air Conditioning Systems (MACS). Additional modules 7543-01-002 (Air Conditioning Principles) and 7543-02 (Advanced Diagnostics) may be taken at a later date. 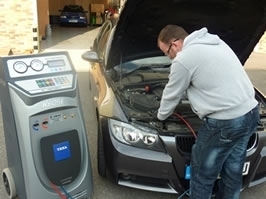 This 1-Day course provides training on automatic service stations such as the one in the photo. For those who are looking to broaden their knowledge and skills, this course also provides the necessary ‘entry level requirements’ for the 5-Day Air Conditioning System Installation Course and/or F-Gas courses in refrigeration and commercial air conditioning.